In May, Mom and I went to Quebec, New Brunswick and Prince Edward Island, with some brief stops in New England. We flew into Hartford, CT and drove to Vermont for the first night. Then we drove to Quebec. Inadvertently, our rental car had Texas license plates. This was great for us since it meant we could find our gray car in the sea of other gray cars. Of course, this was confusing to the officer at the border crossing. He seemed confused about the fact that we were from Texas, had flown to Connecticut (and not Montreal!) and were driving a car with Texas plates. We didn't think he was going to let us in the country! 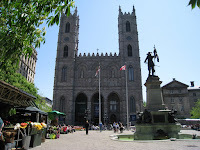 We stayed in Montreal for a few days. 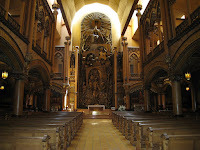 We saw the Notre-Dame Basilica which was quite ornate. Our pictures from inside the Basilica didn't really turn out too well. The light was just too low for fantastic pictures, but we did get a few that turned out. 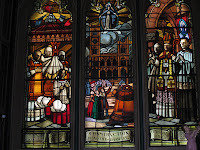 The stained glass windows inside the Basilica showed scenes from Montreal's history. There was elaborate artwork everywhere - altar, walls, floors, ceiling. Even the pews featured carvings in the ends. Behind the Basilica there was another chapel connected to the main sanctuary. 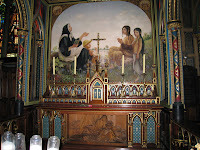 This chapel was a in a completely different decorative style. We also went to the Biodome de Montreal (a kind of indoor zoo), the Insectarium (which featured fire ants crawling from one flowering plant to another over a six foot span of space - very freaky!) 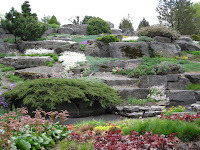 and the Jardin Botanique de Montreal. The Jardin is set up with various different types of gardens - rose garden, Japanese garden, Chinese garden, alpine garden, etc. 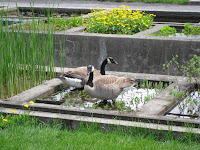 In the water garden we saw two Canada geese peacefully eating. 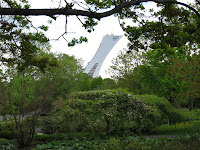 You could see the tower from the Olympic Stadium from the Jardin. Our bed and breakfast, Au Gite Olympique, was right across the street from the stadium. The alpine garden was my favorite. Those white flowers (I have no idea what they're called) looked like a cascade of snow falling over the rocks. 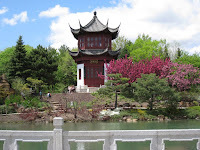 The Chinese garden featured some beautiful buildings surrounding a peaceful pond. 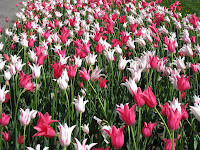 There were tulips everywhere in Montreal and Quebec. These were some we saw at the Jardin. 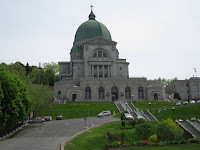 St. Joseph's Oratory, another church, was on the side of Mont Royal. Mom didn't think she was going to be able to make it up all those steps, but she managed. Unfortunately, this was another church with a dark interior, so the pictures aren't that great. And that's too bad because the interior of this church was so completely unexpected. It was far more modern inside than the exterior would lead you to believe. 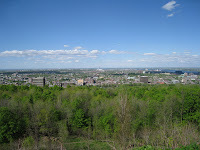 And finally, the view of Montreal from on top of Mont Royal. The Olympic Stadium is in the distance, and the St. Lawrence River is to the right. The next stop on our trip was Quebec City. I attended the Writer's League of Texas Conference last weekend. My manuscript was a finalist in the children's middle grade category. I didn't win, but I did get to meet with some agents. I sent out queries today to those agents. Wish me luck!